Alps | Flights. Camera. Satisfaction. My first visit to the Cascade d’Ardent in France was too short, and I came away knowing that I’d left some great shots on the table. That’s never a satisfying feeling! So on my second trip I arrived with plenty of time to explore the smaller falls upstream. It’s interesting to see how the water flow changes throughout the year, and I’m always surprised by how much it’s affected by the weather. On this occasion the river was pretty shallow, allowing me to get to spots like this that I didn’t dare to venture into before. I’ve been caught out a few times in places I didn’t expect to be slippery and it’s always a quick wake up call! When the torrent is weaker it’s easier to get closer to the water, and it also reveals some nice details in the falls you might not see when they’re at at full strength. 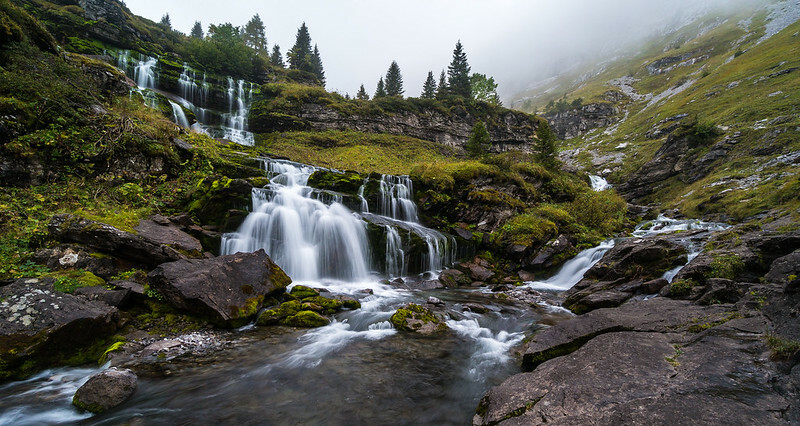 This entry was posted in France and tagged Alps, Cascade d'Ardent, Forest, France, French Alps, landscape photography, nature, Water, Waterfall on December 4, 2014 by Ben. Last time I visited the Cascade du Rouget I had to hike for an hour through snow. It was a nervy journey with a few slips here and there. Not my most enjoyable hike in the French Alps! As I parked the car just metres from the waterfall this summer I felt conflicted about the road being so close by. Surely something of such natural beauty was worthy of more effort than that?! Unfortunately I actually prefer the wider composition of my winter shot. The falls are much more powerful in the summer, and there was way too much spray to get into the same position. I set up my tripod further to one side and started shooting, but it quickly became clear the spray was still going to be an issue. I had to cover my lens with a lens cloth, start the 10-second timer I use for tripod shots to avoid camera shake, count to 9 and then remove the lens cloth just before the shutter opened. Of course this was not an exact science, and I had plenty of attempts where the lens got wet before the shot was taken or I removed the lens cloth too late. I should really invest in a remote shutter release! 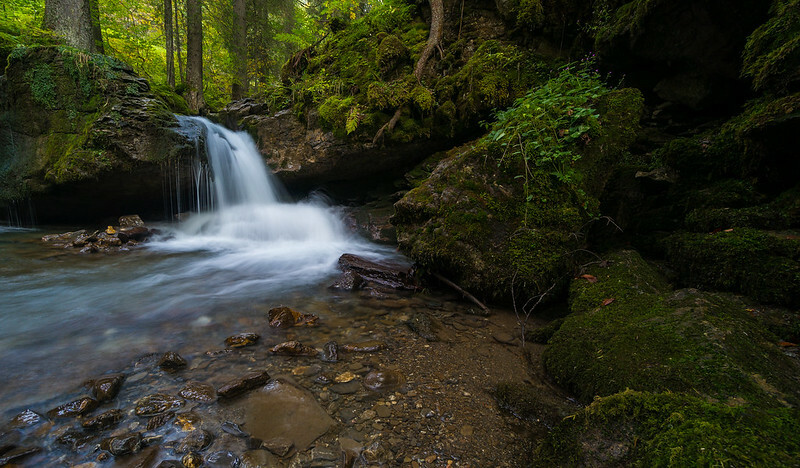 This entry was posted in Europe, France and tagged Alps, Cascade Du Rouget, France, French Alps, landscape photography, nature, Summer, Water, Waterfall on November 21, 2014 by Ben. After a six hour hike around the nearby mountains, this magnificent autumn colour in Lac de Joux Plane was the perfect way to end the day. The yellow leaves are still hanging on to their branches before winter grips the Alps, and I’d quite like to hang on to autumn in the same way. Is there a more beautiful time of year? I only had time to try a few different compositions here, and this was the best reflection I managed to capture. There were some pesky ducks around the lake, bobbing in and out of the water on a fairly frequent basis. They created some nice ripples but weren’t really helping me very much! Although I took more zoomed in shots of these trees and their reflection, I preferred this shot with the foreground interest in the end. 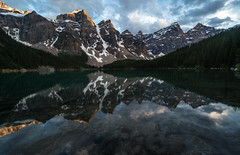 Being able to see the bottom of the lake gives the image more depth and hopefully draws the viewer in. That’s the theory anyway! 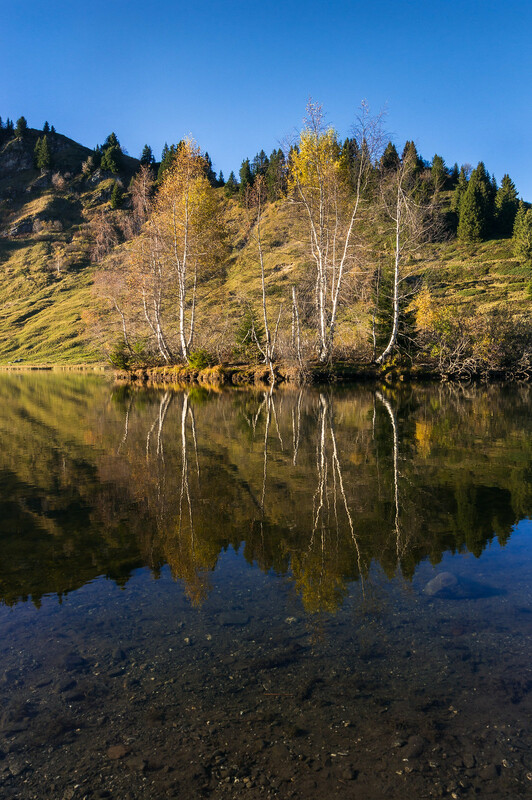 This entry was posted in France and tagged Alps, Autumn, autumn colour, France, French Alps, Haute-Savoie, lac de joux plane, Lake, lanscape photography, mountains, Reflection, Water, yellow on November 3, 2014 by Ben. From the car you’re never that close to the torrent that runs through the Gorges du Bronze, but there is a spot where you can park up and walk down to the water. It’s not a marked trail so you have to use your imagination a little, but it’s only 150m or so. I had the place completely to myself, so I spent a couple of hours just exploring up and down the river. I saw a number of paint markings on rocks here which I think are used for canyoning routes. Have you ever heard of canyoning? The basic idea is to follow a canyon through the water, rappelling, climbing, jumping and swimming your way down. I’ve never tried it myself, it’s always been the wrong side of my risk/reward scale! 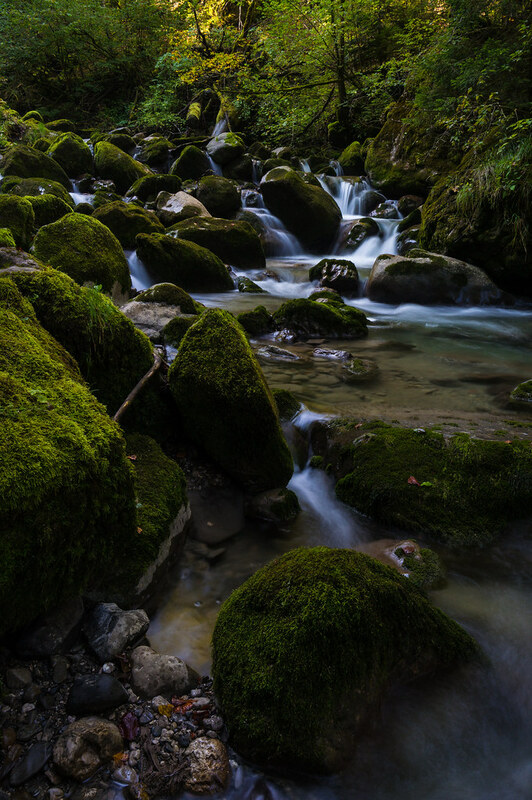 This entry was posted in France and tagged Alps, Enchanted Forest, Forest, France, French Alps, Gorges Du Bronze, landscape photography, Water, Waterfall on October 27, 2014 by Ben. Towards the end of the ascent to the Refuge de Sales is this incredible waterfall – the Cascade de Trainant. Unfortunately I didn’t make it to the end of the hike because I’d spent way too much time at each of the waterfalls along the way. This was the last one I had the privilege of seeing on the incredible journey. At this point I was very glad I’d made the effort to carry my tripod uphill for two hours. If there’s a hike on which you should definitely take a tripod then this is it. And if you’re a fan of waterfalls then it’s like a dream! If you ignore some of the uphill hiking. I always hate to leave places like this. I would quite happily sit for hours just listening to the water and watching as it works its way down the mountain. Next time I’ll be sure to start the hike a little earlier! This entry was posted in France and tagged Alps, Cascade de Trainant, France, French Alps, landscape photography, Long Exposure, mountains, Water, Waterfall on October 14, 2014 by Ben. I passed waterfall after waterfall tumbling down the valley carved by the Torrent de Sales. Following the river upstream en route to the Refuge de Sales was an incredible experience. 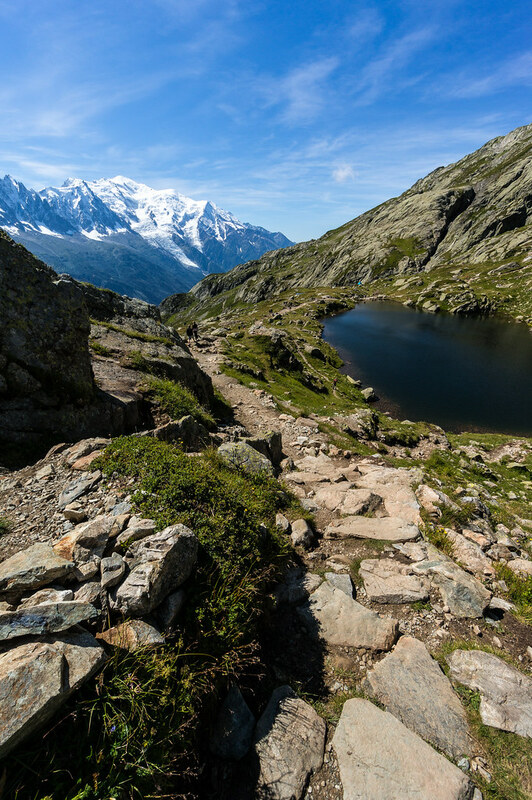 It must be up there as one of the most rewarding hikes in the French Alps. 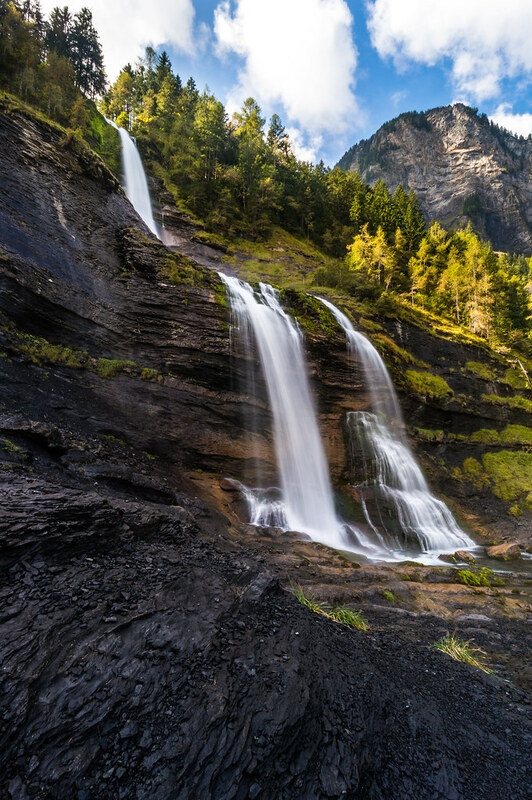 Over the course of the two hour journey from the Chalet de Lignon there are five or six stunning waterfalls waiting to greet you, each seemingly more impressive than the last. I almost couldn’t believe my eyes! It was a pretty exciting place to be with a camera. These narrow falls can be found descending the valley walls toward the end of the hike. I was really happy about the cloudy skies on this trip, they created a fantastic mood and made shooting the waterfalls so much easier. 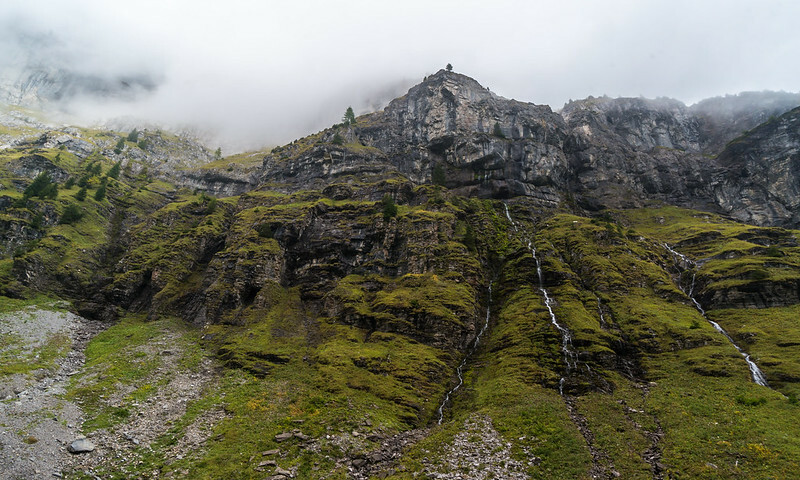 This entry was posted in France and tagged Alps, France, French Alps, landscape photography, mountains, Refuge de Sales, Torrent de Sales, Water, Waterfall on October 7, 2014 by Ben. Hiking along the Grand Balcon Sud in the Chamonix valley was the highlight of my summer exploring the French Alps on foot. The 90 minute trek from the Index cablecar to Lac Blanc and the Lacs des Chéserys was full of incredible views no matter where I turned. But the hike along the same path in the opposite direction was even better, with Mont Blanc in view almost the entire time. 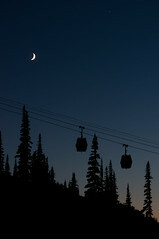 I took this shot just after I started hiking back to the cablecar station to head home. I really can’t recommend this route enough! On the right you can see one of the Lacs des Chéserys, a beautiful collection of small mountain lakes at an altitude of 2111m. To the left in the distance is Mont Blanc, the tallest mountain in Europe at 4810m. From here I spent a bit more time shooting at the lake, before continuing my journey back up the rocky face behind it. This entry was posted in France and tagged Alps, France, French Alps, Grand Balcon Sud, Hiking, Lacs des Chéserys, Mont Blanc, Mont Blanc Massif, mountains, nature, Photography, Travel on August 28, 2014 by Ben.